Allemande sauce is a sauce in French cuisine that is based on velouté sauce, but thickened with egg yolks and heavy cream, and seasoned with lemon juice. 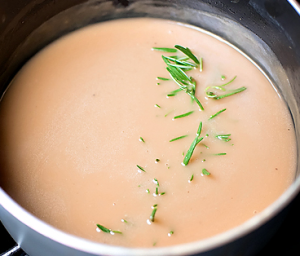 Velouté is one of the five mother sauces of classic French cuisine as defined by Antoine Carême in his classic text The Art of French Cooking in the 19th Century. It is best used with eggs, poached fish, poultry, hot hors d'oeuvres, and dishes topped with a coating of bread crumbs.